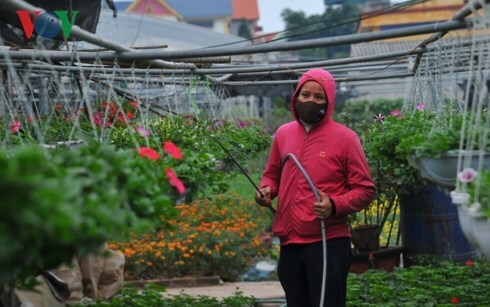 The Red River Delta province of Hung Yen plans to inject 5.6 trillion VND (240.8 million USD) into the new-style rural area building, aiming to have all of its communes win the status in 2019. Of the total funding, 2 trillion VND (86 million UD) will be sourced from district and commune budgets, 900 billion VND (38.7 million USD) is to come from businesses and economic organisations, and 440 billion VND (18.92 million USD) from central and provincial coffers. Meanwhile, 1.8 trillion VND will be funded by other development programmes and projects. Local communities are expected to contribute around 500 billion VND. 60 billion VND (2.58 million USD) will be allocated to Yen My, Kim Dong and Phu Cu districts which have registered for the recognition in the year. Each of the 28 communes in the six districts of Tien Lu, Phu Cu, An Thi, Kim Dong, Khoai Chau and Yen My which have yet to earn the status will get 10 billion VND (430,000 USD). Meanwhile, 16 communes registering to become model new-style rural areas for the 2019-2020 period will receive 5 billion VND (215,000 USD) each. Twenty residential areas which aim to become model new-style rural areas will also get 20 billion VND (860,000 USD). According to Nguyen Minh Quang, Vice Chairman of the provincial People’s Committee, Hung Yen has funneled more than 4.6 trillion VND (197.8 million USD) into the programme since 2018. Nguyen Van Phong, Chaiman of the provincial People’s Committee, said the province has instructed localities to focus resources on rural infrastructure development, and pay attention to such criteria as income improvement, poverty reduction and environmental protection. The National Target Programme on New-style Rural Area Building, initiated by the Government in 2010, sets 19 criteria on socio-economic development, politics, and defence, aiming to give a boost to rural regions across the country. The number of criteria was increased to 20 in 2015 and includes the development of infrastructure, the improvement of production capacity, environmental protection, and the promotion of cultural values. By the end of 2018, a total of 3,787 communes nationwide, or 42.4 percent, have been recognised as new-style rural areas, representing a year-on-year rise of 8.02 percent. In 2019, the target is to raise the percentage of new-style rural areas to about 48-50 percent of total communes. At least 10 more districts are hoped to earn the recognition, while they hope to ensure each commune has completed at least five or more of the criteria.